When Johnny Damon arrived in Fort Myers, Fla., this spring, his first words were "Bless you. Bless you all." As it turned out, it was no blessing in disguise. Red Sox Nation has been blessed with its first World Series championship in 86 years due in no small part to Damon and his facial growth and long-flowing locks. Damon's new spiritual look inspired teammates and fans to adorn T-shirts bearing his image. "W.W.J.D.D. What Would Johnny Damon Do?" read one that was popular with bleacher creatures. Bronson Arroyo preferred the "What Curse? We have Jesus on our side" model. Damon, the most productive leadoff hitter this side of Seattle, collected 189 hits, scored 123 runs, socked 20 home runs, and drove in 94 runs during the regular season. His assault on American League pitchers continued in the Division Series against Anaheim, when he hit .467 (7 for 15), scored four runs, and stole three bases. Then Damon disappeared. And the Red Sox' offense followed suit. Over the course of the first six games against the Yankees in the ALCS, Damon went 3 for 29 with three runs scored. Even as the Sox battled back, winning three straight to tie the series, Damon looked lost at the plate. Boy did he ever have the Yankees right where he wanted them. He led off Game 7 with a single, and though he was erased at the plate later in the innning, he was hardly done. In the second inning, Damon sent reliever Javier Vazquez's first pitch into the stands in right for a grand slam, giving Boston a commanding 6-0 lead. Two innings later, he launched another Vazquez offering into the upper deck. The national television audience saw how impressed Yankees general manager Brian Cashman was with Damon's exploits. Even when it appeared their season was over, Damon, as you might expect, kept the faith. "We're so loosey-goosey," Damon said after dispatching the Yankees in the greatest comeback in baseball history. "After we were down, 3-0, we didn't panic. We were joking about packing up our things, kind of playing devil's advocate by thinking of the worst things possible and making sure good things happened." Damon, of all people, playing devil's advocate? Surely he was going for the obvious laugh. As thousands of New England youngsters were designing their Johnny Damon costumes for tonight's trick or treating activities, Damon and his teammates were designing a plan to send the Cardinals packing. 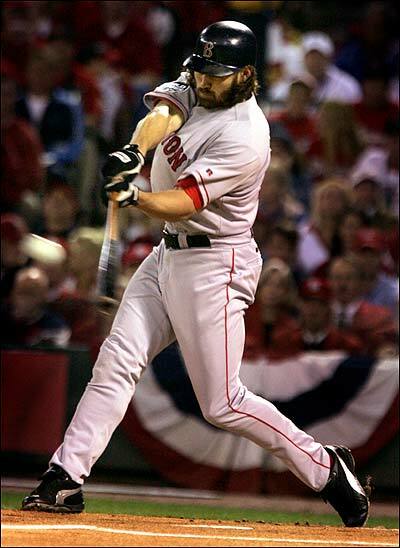 Damon hit .286 (6 for 21) in the World Series and gave all the run support Derek Lowe would need in Game 4, drilling a leadoff home run against Jason Marquis. "A lot of people thought it would never happen," Damon said of the Red Sox' drive to end 86 years of postseason futility. "So to be able to celebrate and carry that trophy, that's what it's all about."